What is Tavli? 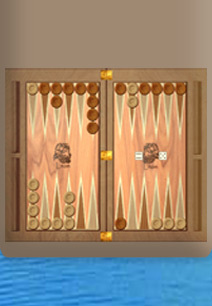 Tavli is a set of Backgammon variations that are very popular in Greece, Turkey and other countries in the south east Mediteranian. For more informations about the Tavli games and their rules click for example here http://www.bkgm.com/variants/Tavli.html or do a google search..
What is Leon? Leon is a neural network based artificial intelligence program that can play the games of Tavli in an amazing playing strength, to our best knowledge the strongest artificial intelligence for Tavli available. Except for its very high level of play, Leon is a very easy to use program, has beautifull animated graphics, original sounds and the user inteface is provided in english, german and greek. ...Leon is with one word ...strong. You play against a world class opponent. If you can win it in a long term, congratulations. your next vacations, local club or online play. Get your free unlock key for 7 days: We provide you a key, so that you can check all features of Leon for 7 days. Go to the Register menu, type your name and a valid email and click on the button "Try all features of Leon for 7 days". If you like Leon please register it for 9.99€!